Made pancakes this morning. No pumpkin this time because my husband likes them plain. You all know what pancakes look like, so no pic was really needed. Did some laundry using this sample that I got from Vocalpoint. 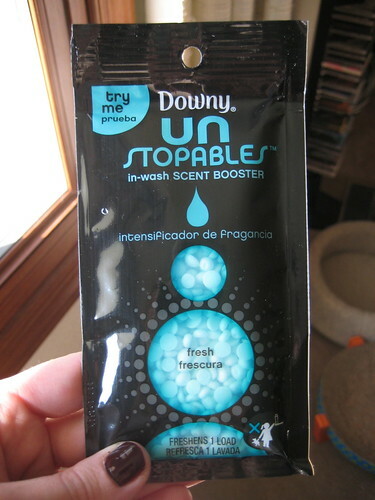 It smelled yummy and seemed to make our clothes softer. 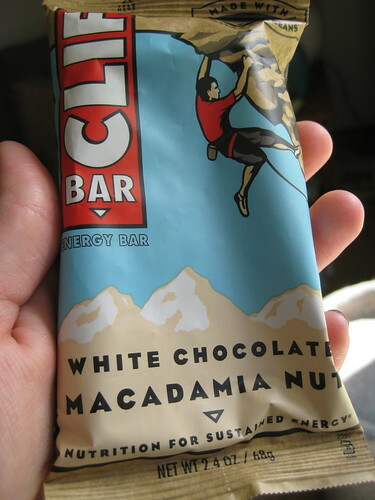 I was still hungry and had most of this Clif White Chocolate Macadamia Nut bar before going to the gym. It is one of the bars I won in Kimberly’s giveaway. I loved this flavor! I think it was the perfect thing to eat pre-gym because I had lots of energy for my mostly cardio workout! 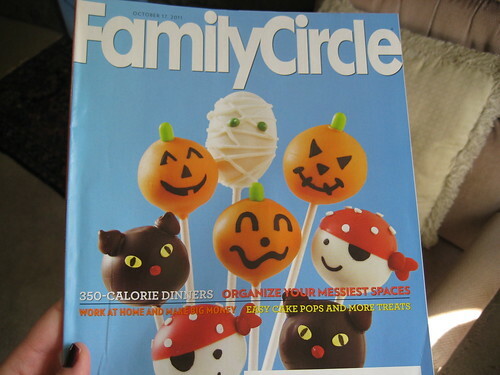 I biked for 25 minutes while reading this Family Circle magazine, featuring adorable Halloween themed cake pops. I also did 15 minutes on the Cybex, some ab work, and a bit of weight lifting. I think the Cybex is one of those machines that does the best job of getting my heart rate up and is easy on my old lady joints. 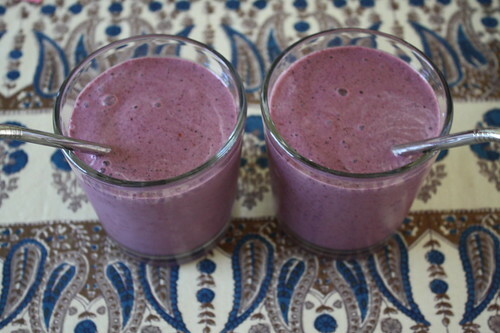 Post-gym and shower, I blended up some spinach, frozen berries, banana, and 2% milk for some his and hers smoothies. I ran to the mall to get my wedding ring cleaned and inspected and then to the eyeglass store to check out the frames. I am searching for the perfect pair before my eye appointment in mid-October so I can get them ordered right away. I am anxious for some new glasses that fit better than my current ones. I considered this pair by the brand Chelsea Morgan, but I am not sure Craig will like them. 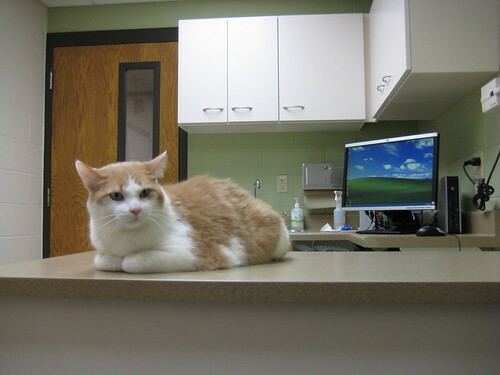 I need a second opinion and he wasn’t with me today. 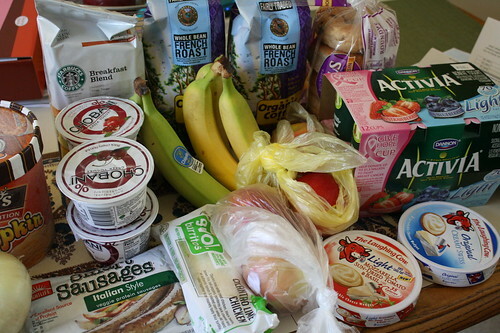 Did some grocery shopping after my trip to the mall. While picking out some Chobani yogurt, I had an odd feeling that someone was watching me. I turned to the right and there was a Brewers sausage waving at me! For those of you who don’t follow baseball (like me) and don’t live in Wisconsin, the Brewers mascots are sausages that race during the game. The sausage standing right next to me freaked me out a bit, but also made me laugh. Glad for all of the Brewers fans that they won today! 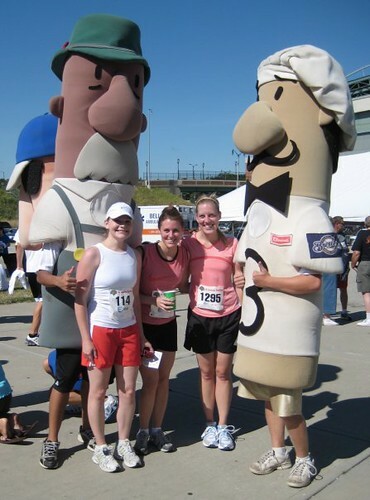 Here is a picture of me back in 2007 with my friend Laurie and her friend after we had just run the sausage race 5k. I am the one appropriately in front of the German bratwurst (because I love all things German). 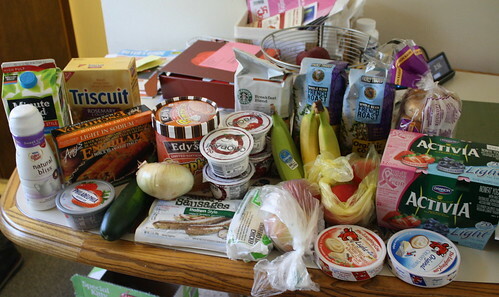 Here is what I picked up at the grocery store. I am most excited about the Pumpkin ice cream. I was also pretty stoked to find lots of great coffee really cheap. A huge 20 oz. bag of Starbucks Breakfast blend was half off, so with a $1.50 off coupon, I got it for $5.50. I also found some Organic coffee whole beans for $4.44 each. Went dark again with my nails for fall. 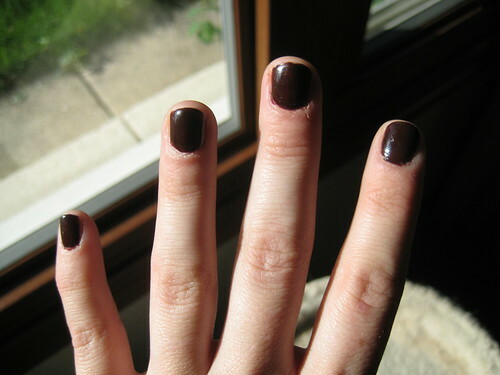 It’s an OPI shade I had from last year. Also went to the gym and got a good workout in (stair stepper, walk/run on indoor track, full circuit of weights), then to the store to get some candy corn and some Libby’s pumpkin. Was relieved to find we aren’t out of the canned pumpkin in our area after I heard on the blogosphere that there has been a shortage this year. 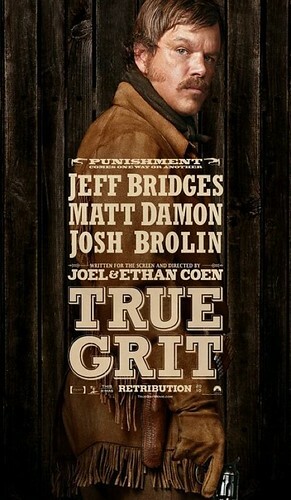 Finally, Craig and I watched the beginning of True Grit, which is pretty good so far. Craig thinks I am like the character Mattie Ross. 🙂 It’s the sassy side of me that he is talking about. We’re watching the rest of it tonight after we head out on a little dinner date. We really never got to formally celebrate our wedding anniversary, so we finally are by going on a date tonight. We are trying an Italian restaurant not far from our house. The menu looks pretty good! I might try a wine flight. I am ashamed to say that I have never ordered a wine or beer flight before, but am feeling like some wine, so I just might do it. I’ll be back with a review tomorrow. I didn’t get to blog what I ate yesterday so here it is. Breakfast is not pictured because I ate it at work. We had a free breakfast as part of the employee of the year award presentation. My co-worker who works in the cubicle next to me won! Anyway, that was probably the most full I have been from a breakfast in ages. 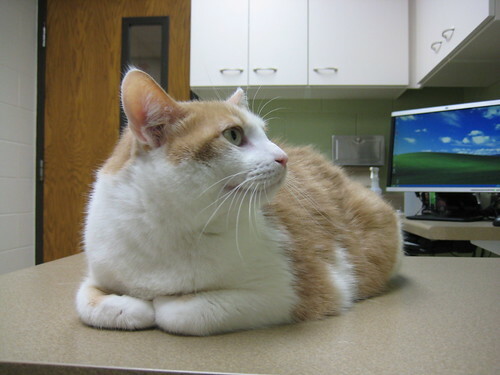 I had fruit, cheesy potatoes, two sausages and then the catering person put a HUGE pile of quiche on my plate. I ate it all and I don’t know why. I guess I would have felt rude in front of my co-workers if I didn’t finish, which is silly. As a result of such a big breakfast, I didn’t eat lunch until after 1 p.m. I did end up making the Brie, Apple and Arugula Quesadilla the night before and packed it up for lunch. It was good leftover, but better fresh. 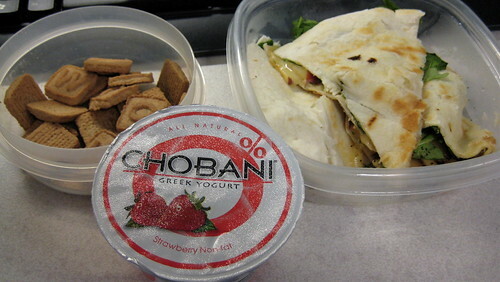 I had some Newman’s Own Organic graham cookies with it, but didn’t eat the Chobani pictured. Breakfast today started out with more free food, courtesy of work leftovers. 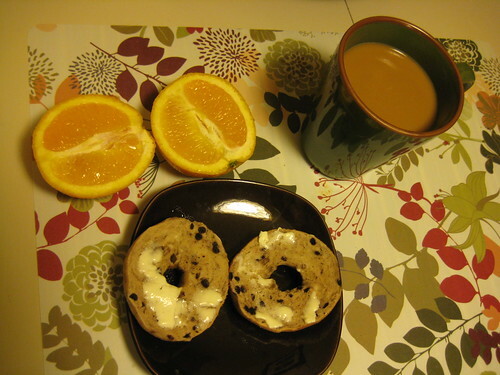 I had an orange and a chocolate chip mini bagel topped with butter. I had lunch pretty early, around 11 a.m., because I was hungry and because I had to leave work around 12:15, otherwise I would be over on my hours for the two weeks. 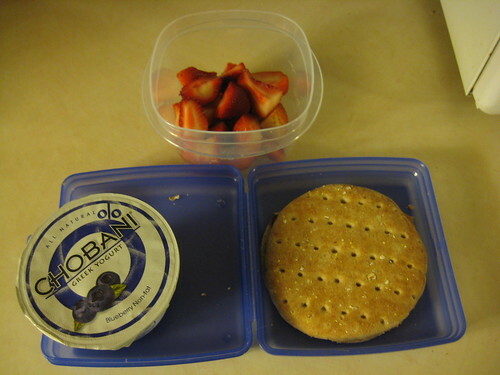 I had the pb & j sandwich, blueberry chobani and strawberries that I packed for lunch yesterday. I added the strawberries to the yogurt and it was really excellent tasting. It’s almost the weekend! Happy Veteran’s day! 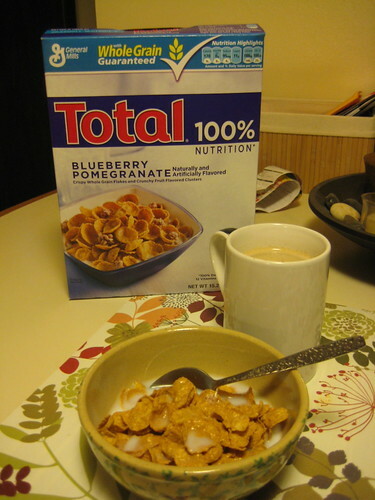 Breakfast today was Total cereal-Blueberry and Pomegranate flavor. It was very yummy! I got up at my normal time today, but hit the gym from 6 a.m. to 7:10 a.m. and showered after. 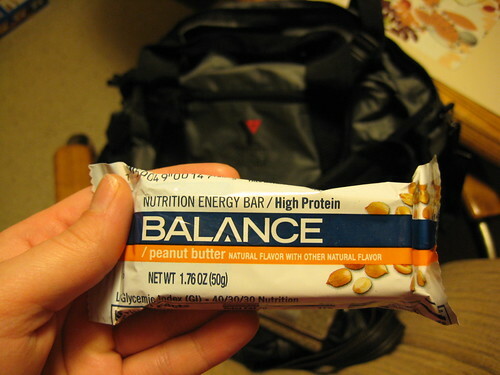 I had half of a Balance bar before heading out the door. I had to go to an urgent care center after 8:30 a.m. to get my foot checked out, so I decided to go to the gym before heading to that appointment. It felt good to workout in the morning, but also kind of odd. Even though I was there for an hour plus, I wanted to stay at the gym and do more, but I knew I couldn’t because I had to get going. That is why I like going in the afternoon–it doesn’t really matter if I stay longer. Today’s workout included biking for a half hour and I lifted all arm weights.